The Russian Cherry-popping! | personal.amy-wong.com - A Blog by Amy Wong. Guess who took her first dive into Russian? That deserves its inclusion on the language category, as well as a “russia” tag, no? ‘Coz I’m suspecting there will be a lot more Chulpan Khamatova postings around. First impressions on the language? I thought it was easier and less scary than Hebrew (which I once tried to learn, I don’t know if I ever confessed to that). The new alphabet seems to be quite straight forward (though a bit weird to write). Anyone wants to tell me the proper direction and how I should be writing the following letters: ц, г, ш, щ, з (is this like a 3? 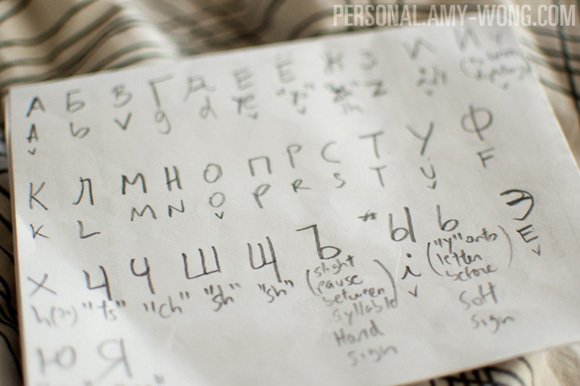 ), ъ, ф (can I write it like an “o” with a line across it? ), п, л, д, ж (especially this one), э, я and и (when I write this, I feel like a 5-year-old that can’t write, though I read the inverted “N” should look like a script “U” when handwritten), ч, б, and ю.
Pronunciation-wise, you guys have soooooo many diphthongs. It might be unsettling to my Spanish brain. I also noticed that because of the inflections of voice and the use of so many “y” sounds, my voice sounds different when I repeat Russian. It’s weird. I also can’t tell the difference between ш and щ. And I also can’t figure out how to pronounce ы properly. And the Russian keyboard is freaking me out. I might need to put stickers on my keyboard now. But then I would have to consider adding a Korean one as well. Sighs. Numbers are already scaring me. Kamathova, Mamamoo and Cranston! Oh, My! Hiragana KATAKANA for the English-speaking Kids! !